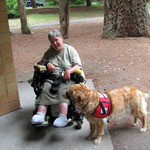 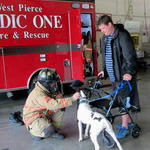 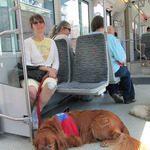 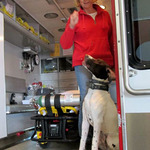 Our activities involve the many aspects of using a service dog to mitigate a disability. 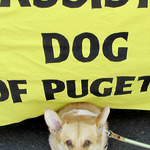 Of course, the primary reason is to enhance one's sense of independence. 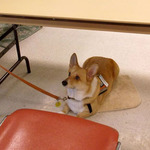 That involves educating the public and the continued process of training our dogs. 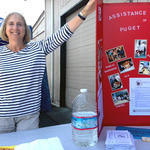 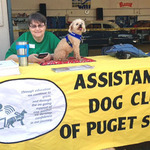 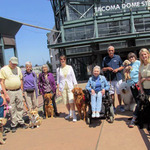 The Assistance Dog Club of Puget Sound jumps at every opportunity available to educate the public. 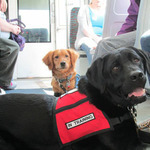 That includes visits to local Fire Departments, representing the club at public events, visiting the airport and familiarizing our dogs with an airplane while at the same time familiarizing the flight attendants with our service dogs. 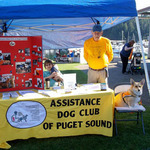 Educational games are always held at our summer picnics and at some of our meetings to perpetuate the training of our dogs. 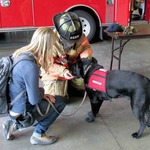 Public events offer us the opportunity to share with one another new types of gear, some purchased and some made, newly found treats for training, some purchased and some homemade. 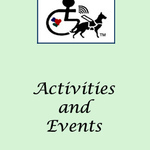 Our fundraising activities present us with the chance to not only meet the public, but to also create items to sell, gifts to wrap and many other activities. 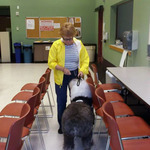 Click on the first photo to start the slide show!